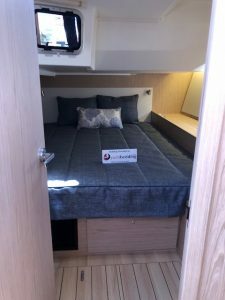 It would not be wrong to state that Beneteau Oceanis 51.1 is a stylish and comfortable addition to today’s generation of sailboats. Some of the main exterior features include stepped hull, stylish deck and taut lines. The interior is done by Nauta Design. The use of brushed oak and mahogany keeps it light and airy and works great for ambience. 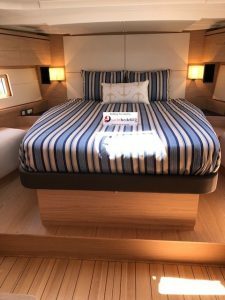 The images show our bedding we did for this boat. 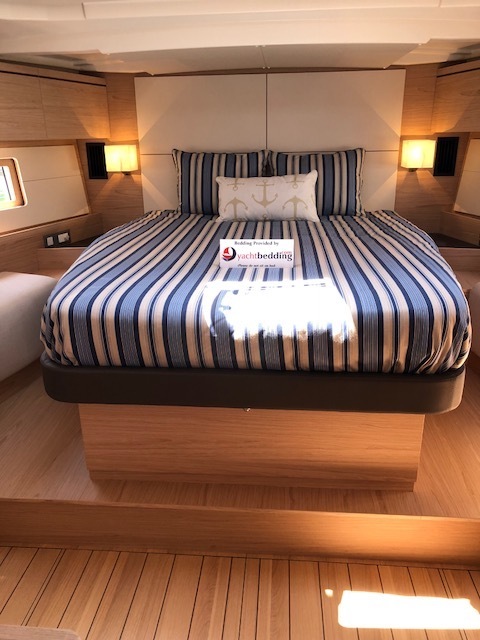 Our custom sheets, custom duvets and custom coverlets with fun throw pillows adds beauty to the elegant look of this boat. We make everything custom to fit the size and shape of your boat. We choose our materials wisely to stand up to the rigors of the marine environment. Our 600 thread-count Egyptian Cotton sheets are always our number one recommendation to our clients. Available in variety of colors, our sheets give a manicured look to your bed. We also carry the Sferra selection for our percale lovers. Browse our website to check out the entire collection including Sferra Analisa, Sferra Celeste, Sferra Fiona and more. Our sheets are sold as set and almost all the time ordered together with our bedspreads. We have put together our best-selling packages as a quick and easy way to order custom bedding for your boat. All our products can be ordered individually and fabrics can be mixed and matched as well. All packages include a quilted coverlet, two standard shams, blanket, sheet set, and throw pillow custom made for your specific bed. You will find our Best-Selling Bedding packages on our home page. Feel free to browse through. All packages are intelligently put together by our designer keeping in view the likes and tastes of our clients and at the same time combining the elements of design in a creative manner.